This boy was supposed to be our up coming King and we were so excited about this boy! 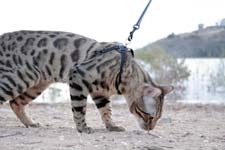 Not only does he have one of the most amazing marble patterns we have ever seen, but his head bears a strong resemblance to the Margay, one of our all time favorite cats! Every time we look at this boy, we get so excited. Unfortunately, this gorgeous boy has proven to be infertile, so our big plans for him will not be realized. It has been a great setback to our cattery and we are very sad and disappointed. Introducing our upcoming King, RoyalBG's First Snow Prince. 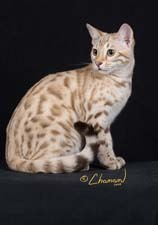 This little guy is the offspring of On Safari Breeder's Choice Best Adult Marble and Adult Body and Breeder's Choice Best Bengal Kitten, Best Spotted Kitten, and Wildest looking Bengal Kitten. His Dam is also a Regional Winner and Supreme Grand Champion! This boy inherited the best of both of his parents. He has a gorgeous and wild looking face, with the broadest nose I've ever seen, and the puffiest nose leather and muzzle. The texture of his coat is smooth to the touch and he is wonderfully contrasted. Attached to his great body is a big fat tail, that is hard to keep your hands off of. 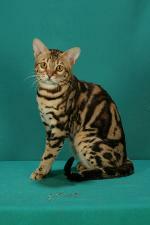 He is just an amazing boy, and we can't wait to see what gorgeous and wild looking babies he will produce. Well, we decided to keep this typey and sweet boy from our RW SGC Faroutbengel Princess Zoey of RoyalBG and IW SGC Mainstreet Dakota. This boy has the full package. A gorgeous head, great profile, smallish and well set ears, long torso, muscular body, and great contrast. He is a complete sweetheart, though he refused to show this side of him at the shows. Despite his complaints while showing, he managed to earn his Champion title. To our regret, we will now stop showing him and instead allow him to live the life he has been yearning for--the life of a stud. We can't wait to see his babies, and he can't wait to make them!